Description: Make a bold style statement and create a breathtaking room that you love with this dramatic ceiling fixture. A striking geometric lighting design on a grand scale, Zephyrine reveals a large inverted design with two tiers of complementary Mission styled diffusers showcasing Ambra Siena Idalight crowning a smaller Tawnyrock Idalight shade. 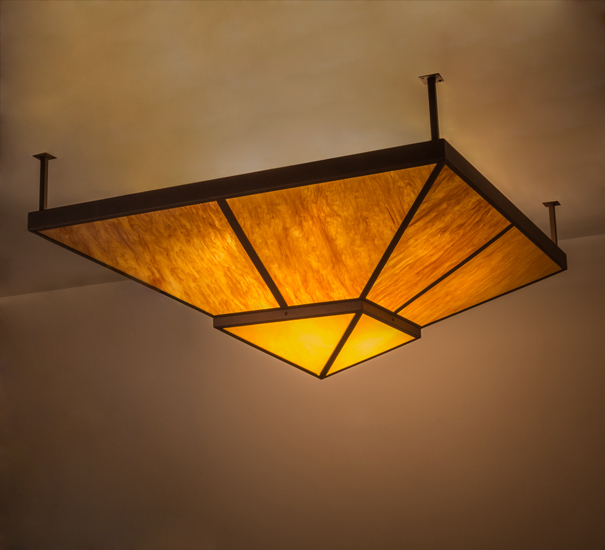 This transitional luminaire is enhanced with straight line accents, frame and hardware featured in an Antique Rust finish and perfect for illuminating entryways, foyers, conference rooms, lobbies and other spaces. Zephyrine features quality materials and hand detailed American craftsmanship perfected by years of time honored artistry, passed down from generations of prolific artisans.